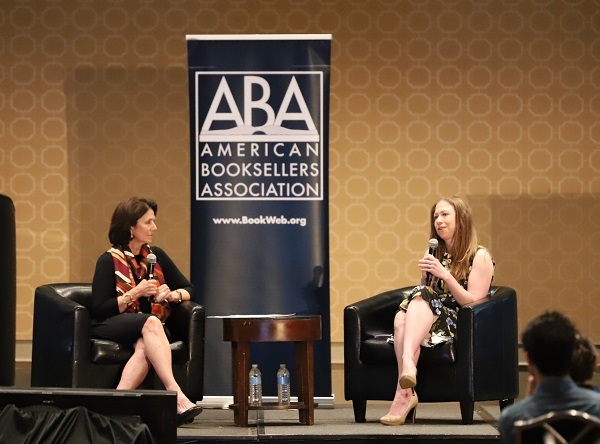 At the ABC Children’s Institute in New Orleans, Chelsea Clinton shared her thoughts with Lissa Muscatine, co-owner of D.C.’s Politics and Prose, on the importance of children’s literature and writing books that teach kids about activism. As part of her talk, Mallika Chopra, author of the forthcoming children’s book Just Breathe: Meditation, Mindfulness, Movement, and More, led booksellers in a guided meditation exercise. This week, more than 300 independent booksellers traveled to New Orleans for ABA’s sixth annual ABC Children’s Institute, an event that has become a favorite on the industry calendar. Chelsea Clinton will appear in conversation with Lissa Muscatine, co-owner of Politics and Prose in Washington, D.C., at the sixth ABC Children’s Institute in New Orleans. Just traveling to such a wonderful place is excitement enough, but combined with Children’s Institute’s education sessions, authors, special events, and keynotes, we’re anticipating an outstanding few days. Here’s an overview to help you navigate the busy, exciting days ahead. Backlist character costumes will be judged by a surprise panel of industry friends and prizes will be awarded across a range of categories. The ABC Children’s Institute is a perfect opportunity to share a unique bookselling experience with customers, friends and family, and fellow booksellers on social media. With the 2018 Children’s Institute just around the corner, now is the time to review this helpful checklist filled with reminders and tips for how to best navigate the event. Decked-out booksellers attending Children’s Institute’s first-ever backlist children’s book character costume party will have the chance to win an array of spectacular prizes.